Yeehaw! We Saved a Spot Just For You! ​Event starts Monday September 26th until Saturday October 1st! Select from a variety of classes in Dance and Music! 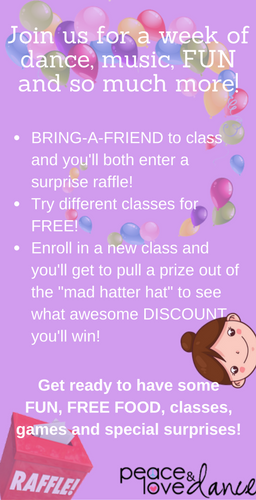 * Unlimited classes for you! All activities are age appropriate! We'll see you during our Open House! Come Ready to Dance & Have Fun, but with the Proper Attire! Proper attire includes: Comfortable clothing, leggings, tights, sweatpants, sports bra, tan top, leotard, t-shirt, jazz shoes, ballet slippers, sneakers, socks. Please no jeans, boots and/or jewelry! Your reservation is for our Open House event from September 26th until October 1st, 2016. Call us to schedule the classes your would like to attend. There's no limit to the classes your child can take during this week! Only registered child can attend. Parents are not allowed in classroom during the event. You are welcomed to stay in our waiting area. Children must attend with proper attire and no jewelry.